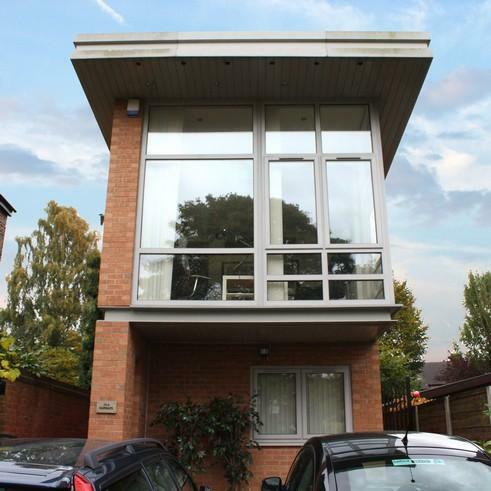 A two storey, two bed roomed individual property built in an established residential area overlooking Worsley Golf Course. In plan the main living accommodation was placed at first floor to exploit these Golf Course views. The striking modern design responds to reluctance by the local authority to give planning permission for a copy of the local vernacular and a need for something out of the ordinary. This was based on the fact that the plot although deep, was less than 6 metres wide and any development would need to have a strong identity to counteract the massing of the neighbouring Victorian and Edwardian villas.